OMG! I am so glad to see your post! I am posting some pictures for you. There are a bunch on Formica's face book page and I will find the link for you right now. I went to the contractors shop and he laid out the 5' x 12' sheets for me to see. I was able to use painter's tape and choose where each counter "section" came from. 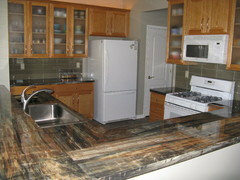 overhj01- here is the link to see the pictures of our kitchen. what is the name of the granite? “Wow, there are so many options. First, I wonder if they have a more contemporary or traditional kitchen. A subway tile in a lighter color found in the Blue Storm could work for either contemporary or traditional – white, light gray and even the gold might look nice with black cabinets. Just be mindful of other backsplash options getting too busy with the Blue Storm … glass tile could easily do this, especially if it is tiny or multi-colored. The homeowner could also use the Blue Storm as a backsplash and go all the way up to the bottom of the upper cabinets for a more European look. This look is starting to gain more popularity beyond just white marble and is happening more and more with other stones. I am doing black kitchen cabinets and love the Blue Storm Formica. - Black cabinets, with Blue storm formica - what should I use for a backsplash or paint color in my kitchen? Personnally I would go for either light grey (close to the stnl steel grey) or beige (like the paint) subway tiles for your splash back. 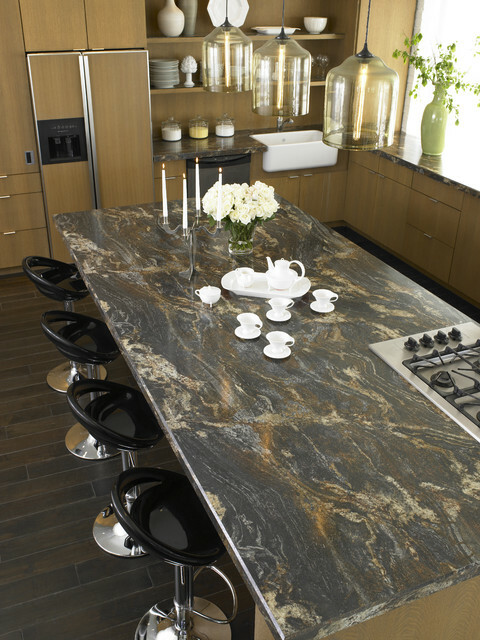 Nothing that distracts from the beautifully dramatic countertops. What are you putting on the floor ? any updates from Formica Group on this? I am looking to have a 60/40 33" stainless steel apron sink with laminate countertop in an island... raised about 1/4 over the edge of the countertop to be 'top mount' style. is that an option or do I have to get butcherblock ? with copious amounts of caulk. Could this colour of granite work with white cabinets? What is the name of this formica laminate, please? This is Formica® Blue Storm 180fx®. Here’s link to more information on this pattern: http://bit.ly/Zo58yG. Thanks for reaching out! 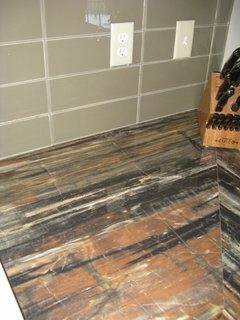 How do you protect laminate countertops and flooring? Plastic laminate is usually used for counters, cabinets, and wall panels (backsplashes in commercial applications). It is not usually used as a flooring. Plastic laminate is durable under most conditions. It can burn so hot pots and pans shouldn't go directly on it. It also can chip or scratch with heavy impact, especially near corners and seams. Also try not to leave large puddles of water standing for long at seams, as the adhesive can loosen, and water can seep below - eventually causing delamination. Also take care not to use abrasive cleaners and scouring pads when cleaning. A soft cloth and multi-surface spray is sufficient for cleaning. Formica??!! So striking! - What edge is used here?? Hi Hester - this is our Ogee edge. Thanks for your interest! Kewena - Where the lights purchased? countertops in the photo. Thanks for stopping by! Where can your countertops be ordered/purchased in Canada? - I have been to your website, but seems the "where to buy" feature is not working... I love your countertops and would really like to make a purchase! Hi! If you can email your location in Canada to na.marketing@formica.com, we'll be happy to find you a retailer! Hi there, How do you seal around an apron sink undermount? - We were hoping to do the tavertine silver with a farm style undermount sink, is this possible? Thanks for the inquiry. Unfortunately, we don't have information on all of the features of this kitchen as this is a real homeowner's house and not a staged kitchen we created for our product photography. If our designers can find out what floor material was used here, we’ll post it on this discussion thread. Thanks again for reaching out. floor is beautiful! - can you tell me what product flooring you used? Thanks for the inquiry. Unfortunately, we don't have information on all of the features of this kitchen as this is a real homeowner's house and not a staged kitchen we created for our product photography. If our designers know what type of flooring was used here, we’ll find out and post it on this discussion thread. Thanks again for reaching out. What are the cabinets please? This is a real homeowner's kitchen we shot about four years ago. We don't outfit the kitchen with cabinets, etc., for the photoshoot, but I'll check with the appropriate folks within Formica and will respond to this thread if we're able to track down the information. Love this as an island. What Formica styles go with this? - I have dark cabinets and was possibly looking at this for my kitchen island, but was wanting lighter countertops for my other counters. Do you have any suggestions on other Formica styles that might go with blue storm? Who makes this pendant light? This looks like stone doesn't it? Well it's not. It's a new high-definition laminate from Formica. In person, this laminate has a glittering, prismatic effect that makes it look even more like natural stone than it does in this photo. Subway Backsplash Tile, Shiny Gloss, 3"x6"